For an elegant touch, use our REAL freeze dried rose petals. Made from fresh red roses, these petals are preserved so you can order them well in advance, then decorate on your schedule. Contains 24 cups of REAL burgundy freeze dried rose petals, 2 rose scented tealight candles, and 4 unscented candles. The Romance packages below contain our realistic SILK Rose Petals plus scented and unscented candles. It's everything you need to surprise that special someone. Please note that the packages contain more petals than shown in the photos below. 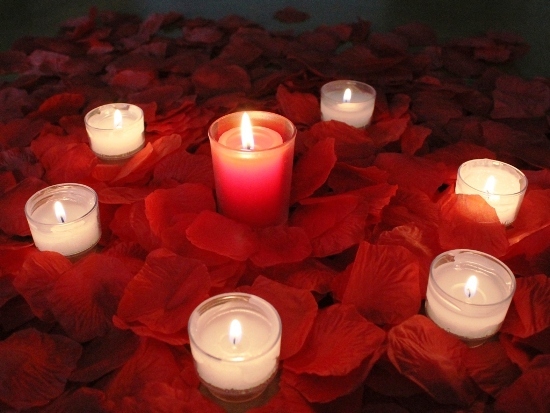 Contains 3,000 red silk rose petals, 6 rose scented tealight candles, and 15 unscented candles, our BEST VALUE! Contains 1,000 silk rose petals in a Valentine Mix, 2 rose scented tealight candles, and 4 unscented candles, enough to create a romantic atmosphere in a small bedroom or apartment. Contains 1,000 red silk rose petals, 2 rose scented tealight candles, and 4 unscented candles, enough to create a romantic atmosphere in a small bedroom or apartment. Contains 2,000 silk rose petals in a Valentine Mix, 4 rose scented tealight candles, and 8 unscented candles, sprinkle petals on a bed and scatter around a candlelit room. Contains 2,000 red silk rose petals, 4 rose scented tealight candles, and 8 unscented candles, sprinkle petals on a bed and scatter around a candlelit room. Contains 4,000 silk rose petals, 6 rose scented tealight candles, and 15 unscented candles, create a trail of petals to a candlelit bedroom, with petals on the bed and across the room, plus the scent of roses in the air. Contains 4,000 red silk rose petals, 6 rose scented tealight candles, and 15 unscented candles, create a trail of petals to a candlelit bedroom, with petals on the bed and across the room, plus the scent of roses in the air. For a more economical option, the two Romance packages below contain an assortment of Red, Pink, and White Artificial Rose Petals, plus scented and unscented candles. While not as realistic as the petals above, they still make a great decoration for a candlelit room. Contains 1,500 artificial rose petals, 1 rose scented candle, and 6 unscented candles, enough to create a romantic atmosphere in a small bedroom or apartment. Contains 2,500 artificial rose petals, 2 rose scented candles, and 10 unscented candles, enough to sprinkle petals on a bed and scatter around a candlelit room.